The young guys were successful. 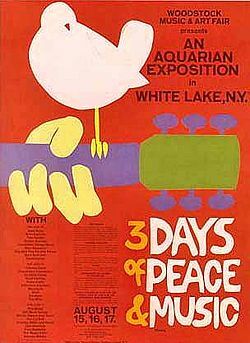 They met with Michael Lang and Artie Kornfeld to establish a legitimate venture, aptly titled Woodstock Ventures. The year was 1969. The Woodstock concert they designed changed the history of Rock’n’Roll. During a rainy weekend, 32 acts were played outdoors before an audience of 400,000 young people. Joan Baez, The Who, Jefferson Airplane, Santana, Grateful Dead and, of course, Jimi Hendrix were some of the performers. About 200,000 tickets were pre-sold. Tickets for the three-day event cost $18 in advance and $24 at the gate (equivalent to $120 and $160 in today’s money). But on the day, the crowds kept growing. The organisers responded – they cut down the fences and turned it into a free concert. According to Wikipedia, the story goes that some performers like The Doors turned down the invitation because they thought it would be a “second class festival”. They later regretted that decision. In business, organize one big event like this, and you’re made. ☺ Unfortunately such seismic events happen very rarely, and when they do happen you might not be ready for it – or you might make a critical mistake. Woodstock Ventures successfully managed both the overwhelming crowd and the authorities who wanted to get the event cancelled, due to safety considerations. Today, the partners of the venture are cited as the architects of an incredible moment in the history of music. I think that their successful management was due to the fact that all four partners were complementing each other, with their various strengths in business, and their understanding of their customers. In such “beyond the imagination” cases, luck alone is not enough. You’ve got to know what you’re doing, too.